Polpo in Beak Street was opened in September 2009 in a building which was once home to the Venetian painter Canaletto. Polpo is a bàcaro; a Venetian word to describe a humble restaurant serving simple food and good, young local wines. You will enjoy “gusty” italian food at non eye watering prices (in London standards). This fantastic seafood restaurant is located on the front in the town of Dartmouth and is the product of two men’s – Mat Prowes and Mitch Tonks – lifetime’s obsession with fish. The current menu features a variety of species depending on daily availability. According to the Observer Food Monthly the dishes are not cheap, but “fish of this quality never should be”. The restaurant, which is named after the chef Sat Bains is located in an “industrial wasteland” in Nottingham and serves a variety of ‘tasting’ menus. These tasting menus range from seven to 10 courses, which are built around a colour coded system of five distinct tastes. The dishes are given extremely ordinary names so they won’t give you an idea of what you will be receiving. This restaurant has been open since 1926, but has only been included in this list due to its recent revamp and the way it has operated over the last 12-months or so. The hiring of new chef Jeremy Lee had a massive part to play in this. The menu changes daily with seasonal produce. They serve a wide range of dishes which come in sharing tasting portions. Situated in Ramsgill, in the heart of Yorkshire’s Nidderdale Valley, the location is not the only appeal. The food, “locally sourced raw materials and finished off with imagination and finesse”, are just as memorable as the view. 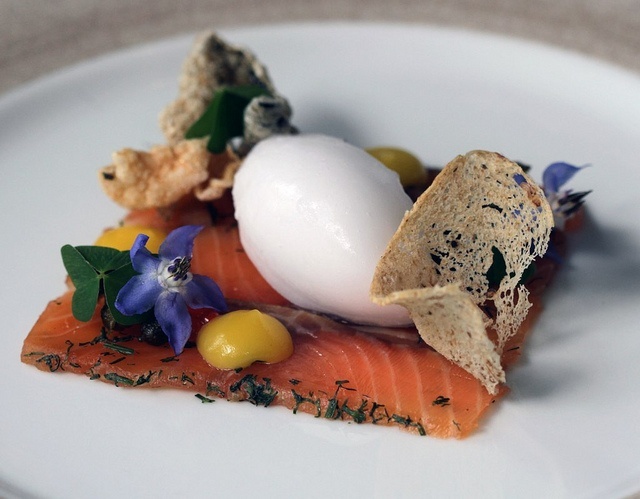 Chef Frances Atkins serves “delicious cuisine, founded on a timeless, classical repertoire”. This husband and wife ran restaurant has been open since 1987 and has won numerous awards. “The food is a cross between the ‘terroir’ and modern French with very original touches. The menu changes seasonally with great care taken to source the finest local ingredients”. Barshu restaurant is located in London’s Soho and serves the food of Sichuan province in southwest China. Barshu bring the best of the authentic flavours, with the famous characteristics of fiery spiciness. Eating at the self-taught chef Heston Blumenthal’s’ restaurant is an experience of sound, smell, sensory perception, touch, sight and taste. The menu consists of a tasting menu, which is a “sequence of dishes designed to capture a delicious and exciting range of flavours, textures and aromas, but also to bring multi-sensory appeal, some culinary history and a sense of theatre to the dining experience”. This list was put together by the scary food critic Jay Rayner, but we would love to hear about your favourite restaurants, dishes and why you love them so much. If you could write a review and include some pictures, send it over to me and we will post the best one’s up on the blog.